This composite image shows the comparative sizes of eight asteroids. 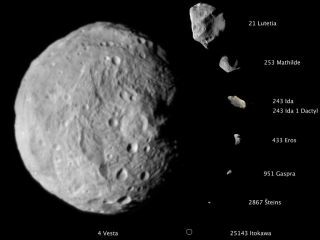 Until now, Lutetia, with a diameter of 81 miles (130 kilometers), was the largest asteroid visited by a spacecraft, which occurred during a flyby. Vesta, which is also considered a protoplanet because it's a large body that almost became a planet, dwarfs all other small bodies in this image, with diameter of approximately 330 miles (530 km). Asteroids are space rocks. Some asteroids are as small as boulders. Others are as big as football fields. Some asteroids are almost as large as planets, and astronomers sometimes argue about whether really big asteroids ought to be called planets or not. Asteroids are made of rock, metals and other elements. Some even contain water, astronomers say. Asteroids that are mostly stone sometimes are more like loose piles of rubble. Asteroids that are mostly iron are more, well, rock-solid. Meteorites found on Earth often come from asteroids, and so they help astronomers figure out what's in asteroids. An iron meteorite can be 91 percent iron and 8.5 percent nickel and might also contain cobalt. A stony meteorite can contain oxygen, silicon, magnesium, calcium and other elements.